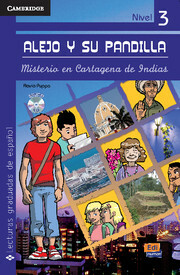 In the third book in the Alejo y su pandilla series, Alejo embarks on a new adventure to South America. His twin stepsisters play in a band with Lorenzo, a Colombian friend who lives in Madrid. Mystery and adventure await when the whole group travels together to Colombia. From the series Alejo y su pandilla, a series of graded readers for young adults and teens, following the adventures of Alejo and his friends as they travel Spain and Latin America. Each reader features color illustrations, an audio CD with a full recording of the text, activities, and a glossary.